ISBN 9790006540631. 31 x 24.3 cm inches. Text Language: German/English. Preface: Klaus Hofmann. 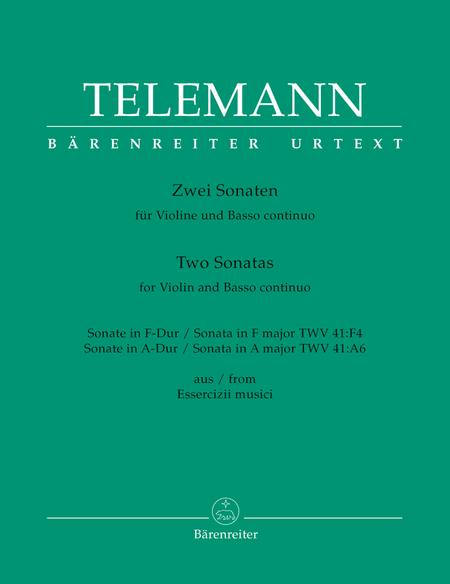 These three editions(BA 5880, BA 5889, BA 5890) each comprising two solo sonatas with basso continuo are all taken from Telemann's famous Essercizii musici; a collection of 24 sonatas including 12 solo sonatas and 12 trio sonatas. These were moulded after Corelli's Sonata da Chiesa and have four movements: slow-fast-slow-fast. 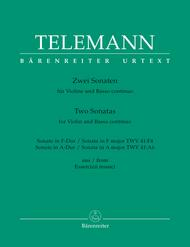 The sonatas long thought to stem from the late 1730s are now believed to have first been published by the composer in approx. 1729. The main sources are the three part-books from the original edition of 1729.